Recently Gennaro Aiello, president of the Elk County Community Foundation Community met with volunteers from the Elk County Historical Society to present a $5,000 check from their recent granting cycle for their microfilm project. This was one of six grants totally $35,400 that were awarded this year from the Elk County Community Development Fund. This Board of Directors reviews applications bi-annually and the criteria is such that they generally look to support community development initiatives that will enhance the economic and community well-being of Elk County. Distribution from the grants can be used to meet special project or program needs of organizations serving the people of the County. This grant will help provide the funds needed to have CompuCom convert the Elk County Historical Society’s newspaper collection from microfilm to digital images that will be searchable. The total cost of the project is $19,750. The Society’s goal is to preserve Elk County’s history in the best way possible. The group met in the genealogy room at the Historical Society where they showed Aiello just a few of the 333 rolls of microfilm. It is their hope that by having the newspapers digitized from rolls of microfilm they will not only be able to better preserve the information held therein, they will also make the data searchable and thus, more useful. This project will enable the Society to share the region’s rich history with more people, faster. Several Board members were educators and they have volunteered to create lessons that can be used with school students as well as our community. The newspapers date back to​ ​1885​ ​and include the following publications: The Ridgway Advocate: Jan 15, 1885 to Dec 26, 1929; The Ridgway Daily Record: (now known as Ridgway Record) Dec 1, 1903 to 2017; The Weekly Herald: (St Marys-Kersey area) July 14, 1889 to 12-24-1904. 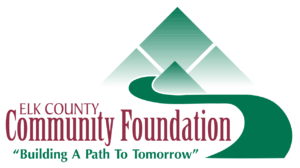 The Community Foundation also administers a number of other funds that makes grants throughout the year. Upcoming grant cycles include the Ridgway Bough Charitable Fund with a deadline of September 15 and the Harrison and Muriel Dauer Stackpole Family Fund with a deadline of October 15. Check out these and the other grant applications on their website at www.elkcountyfoundation.com or contact Paula Fritz Eddy at 814-834-2125. The Elk County Community Foundation is a non-profit organization that manages endowed funds established by donors for area non-profit organizations. Donor gifts are tax deductible to the full extent allowed by law.